While digital programmatic buying of premium video is rising -- much coming from traditional TV networks -- direct advertising deals are still dominant. 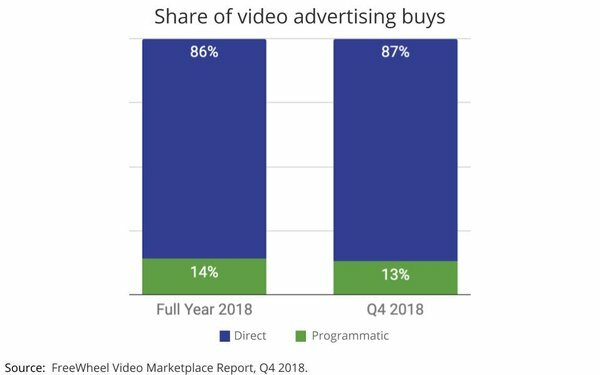 In the fourth quarter of 2018, FreeWheel’s Video Marketplace Report noted direct video advertising deals resulted in 87% of total ad views for linear TV and digital premium video buys -- up 19% year over year. At the same time, digital video programmatic deals now have a 13% share, up 60% from the same period the year before. Full-year 2018 shares are virtually the same -- 87% for direct and 14% for programmatic. Ad viewing results come from desktop, connected TV, set-top box video-on-demand, smartphone and tablet data. The study says premium video delivered high ad completion rates, 80% to 90%, for pre- and mid-roll advertising. The average ad load for a mid-roll break was 3.9 commercials. The biggest share of overall digital ad views is with connected TV -- 42% share; smartphone, 20%; set-top-box video-on-demand is at 16%; desktop, 14%; and tablet, 8%. For 2018, TV network/media companies-owned platforms comprise the largest share of ad views -- 55%, which is 18% more than the year before. Premium video ad views on syndicated platforms are at 45%, up 21% from the year before. A major part of this rise came from MVPD platforms, which had ad view growth of 66% in the fourth quarter, including virtual MVPDs Sling TV, Fubo, Sony Playstation Vue. Comcast’s FreeWheel is one of the largest platforms used by TV networks and major video distributors to serve ads alongside programming content.